"Awaiting the moment when the costermonger is able to procure a barrow of his own he must pay eighteen pence per week for the cost of hiring. Then he must beware of the police, who have a knack of confiscating these barrows, on the pretext that they obstruct the thoroughfare and of placing them in what is termed the Green Yard, where no less than a shilling per day is charged for the room the barrow is supposed to occupy. At the same time, its owner will probably be fined from half a crown to ten shillings so that altogether it is much safer to secure a good place in a crowded street market. In this respect, Joseph Carney, the costermonger, whose portrait is before the reader, has been most fortunate. He stands regularly in the street market that stretches between Seven Dials and what is called Five Dials, making his pitch by a well-known newsagent's, whose shop serves as a landmark. Like the majority of his class, he does not always sell fish, but only when the wind is propitious and it can be bought cheaply. On the day when the photograph was taken, he had succeeded in buying a barrel of five hundred fresh herrings for twenty five shillings. Out of these he selected about two hundred of the largest fish, which he sold at a penny each, while he disposed of the smaller herrings at a halfpenny. "Trade was brisk at that moment, though the fish is sometimes much cheaper. 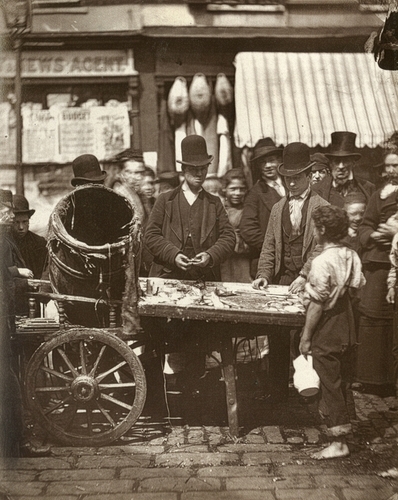 Indeed, I have seen fresh herrings sold at five a penny; and this is all the more fortunate, as notwithstanding the small cost, they are, with the exception of good salmon, about the most nutritious fish in the market."